Mites, along with ticks, belong to the subclass Acarina (also known as Acari) and the class Arachnida. Mites are among the most diverse and successful of all the invertebrate groups. They have exploited an incredible array of habitats, and because of their small size (most are microscopic) most go totally unnoticed. Many live freely in the soil or water, but there are also a large number of species that live as parasites on plants, animals, and some that feed on mold. (insert hard return) Some of the plant pests include the so called spider mites (family Tetranychidae), thread-footed mites (family Tarsonemidae), and the gall mites (family Eriophyidae). Among the species that attack animals are members of the Sarcoptic Mange mites (family Sarcoptidae), which burrow under the skin. Demodex mites (family Demodicidae) are parasites that live in or near the hair follicles of mammals, including humans. Perhaps the best-known mite, though, is the house dust mite (family Pyroglyphidae). Insects may also have parasitic mites. Examples are Varroa destructor which attaches to the body of the honeybee, and Acarapis woodi (family Tarsonemidae), which lives in the tracheae of honey bees. There are hundreds of species of mites associated with other bee species, and most are poorly described and understood. Some are thought to be parasites, while others beneficial symbionts. There are over 45,000 described species of mites. Scientists believe that we have only found 5% of the total diversity of mites. Mites are believed to have existed for around 400 million years. 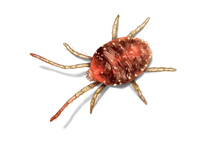 The scientific discipline devoted to the study of ticks and mites is called acarology. The tropical species Archegozetes longisetosus is one of the strongest animals in the world, relative to its mass (100 mg): It lifts up to 1182 times its own weight, over five times more than would be expected of such a minute animal (Heethoff & Koerner 2007).